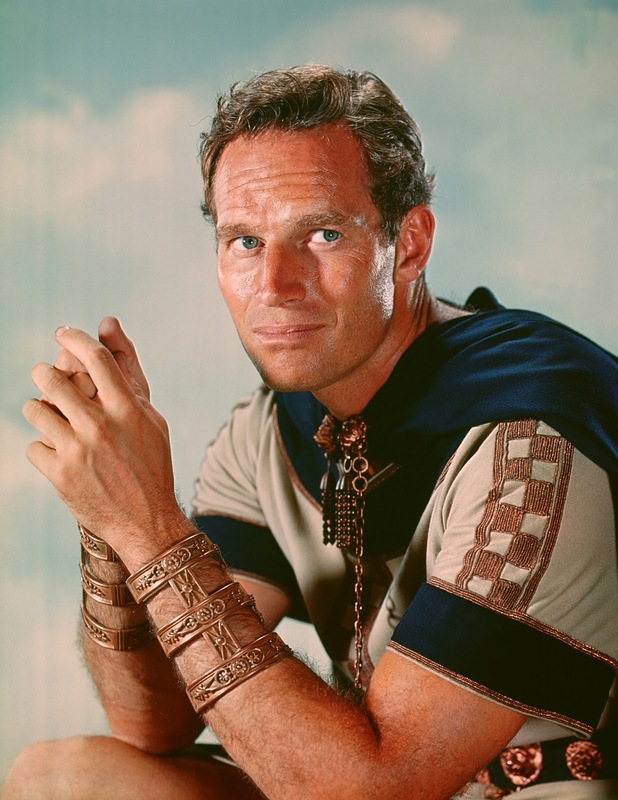 Ben-Hur, starring Charlton Heston, is one of the 1001 classic movies you should see. Each Monday, I'm going to recommend a classic movie you should see (for the reasons behind the 1001 series and reviews of earlier films covered go here). 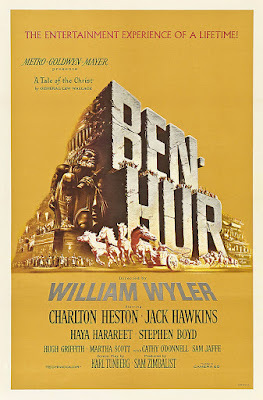 Throughout March, I'll be celebrating the 60th anniversary of The Ten Commandments (1956) by looking at three of old Hollywood's best Biblical epics, starting with MGM's spectacular 1959 remake of its silent classic, Ben-Hur. Ben-Hur tells the story of Jewish Prince Judah Ben-Hur (Charlton Heston) who lives in Roman-occupied Palestine during the time of Christ. Judah is the wealthiest man in Jerusalem, and when his old friend, Messala (Stephen Boyd), returns to take command of the local Roman garrison, Judah thinks they can renew their boyhood friendship. However, Messala wants to use Judah's wealth and status to promote Roman rule among the rebellious Jews. When Judah refuses, it results in unforeseen consequences that tear apart the lives of Judah, his family and his servants. The 1925 version of Ben-Hur, starring Francis X. Bushman and Ramon Novarro, was one of MGM's biggest moneymakers of the silent era. Studio chiefs had toyed with remaking the movie for years; in fact, a sound version starring Marlon Brando made it into pre-production before MGM dropped the idea in 1956. After Paramount Pictures' The Ten Commandments lit up the box office, the studio decided to revisit the idea, this time with Heston, who had starred in The Ten Commandments, in the lead. MGM's gamble paid off when Ben-Hur became the second-highest grossing movie in old Hollywood history -- it was surpassed only by Gone With the Wind (1939) -- and won 11 Academy Awards, including best picture, best director for William Wyler, and best actor for Heston. Ben-Hur is based on an 1880 novel by Lew Wallace that is still one of the most beloved Christian books of all time (yet another remake of Ben-Hur is scheduled to be released this August). Most of the characters in Ben-Hur are fictional, but there are a few Biblical figures, including Roman governor Pontius Pilate (Frank Thring) and, of course, Jesus Christ (Claude Heater). Even so, Ben-Hur is one of the most sensitive of the Biblical epics, which, as we'll see, tended to be campy spectacles that had little to do with Holy Writ. Ben-Hur has plenty of spectacle and a cast of thousands, but it is the most intimate of epics, focusing on one man's journey from hate into God's love. 1. The chariot scene. Although I've written a lot about Ben-Hur's reverence, the movie isn't a boring Sunday school lesson. The film's breathtaking, nine minute chariot race is one of the best sequences in movie history. In many ways, the entire film is centered around the race, with the first half relentlessly building up the tension for the big match. The bravura scene occurs at the top of the movie's second half, and then Ben-Hur quickly wraps up with a reverent passion play. 2. Boyd. There's been a lot of speculation about the Messala character, but, whatever you think of the relationship between Judah and the Roman warrior, Boyd gives the best performance in the film (for the record, I don't think it really matters whether Messala is motivated by a spurned love affair or he is just simply an ambitious company man who has his big schemes spoiled by Judah's intransigence). While Heston nobly plods along, Boyd's method performance is the brooding, charismatic center of the film. 3. Character actors. One of the great joys of Ben-Hur is the great character actors in the supporting parts. Not only is there Hugh Griffith's Oscar-winning performance as chariot owner Sheikh Ilderim -- his showy closeups during the chariot scene are one of the movie's highlights -- but there is also Sam Jaffe as Judah's loyal majordomo, and Jack Hawkins as a tortured Roman general who becomes Judah's adoptive father. 4. Haya Harareet. 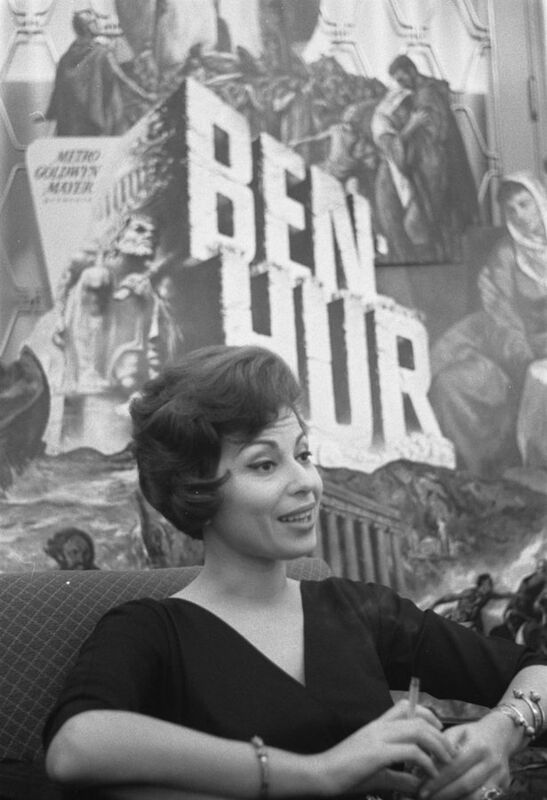 Wyler discovered this Israeli beauty at the Cannes Film Festival, and the role of Esther, a slave woman who is in love with Judah, became the best known of her career. Harareet only made a few films, but I've always thought that her unique screen presence could have made her a much bigger star had she not chosen to concentrate on her family life. Other critics: Ben-Hur is certified fresh at Rotten Tomatoes with an 88 percent rating, and Leonard Maltin calls it "poky at times, but redeemed by the strength of its convictions" in a three and a half star review for his Classic Movie Guide. Critics in 1959 ran out of superlatives when praising the film. Bosley Crowther of The New York Times did complain a bit about the movie's length before raving that "there has seldom been anything in movies to compare with this picture's chariot race. It is a stunning complex of mighty setting, thrilling action by horses and men, panoramic observation and overwhelming use of dramatic sound." Los Angeles Times critic Philip K. Scheuer just gave up on heaping praises on the movie in his review. Ben-Hur is "magnificent, inspiring, awesome, enthralling, and all the other adjectives you have been reading about it," Scheuer wrote. 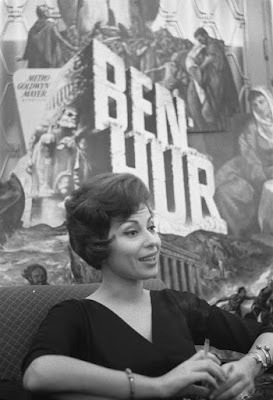 Haya Harareet promoting Ben-Hur in Amsterdam. The bottom line: Ben-Hur does sometimes get bogged down by the weight of its own reverence, but it is still one of old Hollywood's best movies, and the chariot scene is one of the great moments in cinematic history. Availability: Ben-Hur will air at 8 p.m. March 20 on TCM. It is also available on DVD, Blu-ray, and video on demand. Next Monday, I'll continue the March theme of Biblical epics with a look at The Ten Commandments. I loved your review! I actually just read the book for the first time and enjoyed it and am now going to watch the film again. It's been quite a few years since I've seen it. I completely agree with you about it being one of the great Biblical epics! And about Haya Harareet. I was a little surprised that Esther's was a pretty small role in the book, but I liked how they built up her character for the film. I picked up the book at the library the other day. I was curious to see the changes they made in the movie.